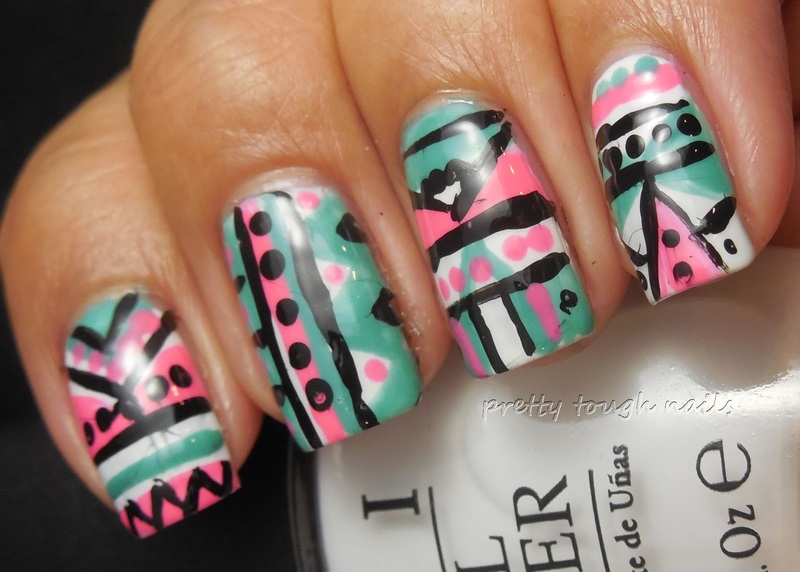 I've never done tribal print nails before so today's challenge was a novelty for me. I remember when I was in elementary school we had a project in art class where we drew tribal posters to hang up in the hallways, and I would endlessly paint tribal posters. Come today, I have no idea how to start. I decided to choose my colors first, so I went with some untrieds - Model's Own Slate Green and Illamasqua Devotion along with Wet n Wild Black Creme. I layed down three coats of OPI My Boyfriend Scales Walls, which, by the way, after this try is not my favorite white. Next, I randomly drew some lines color by color with the nail brush, and then followed with the dotting tool. 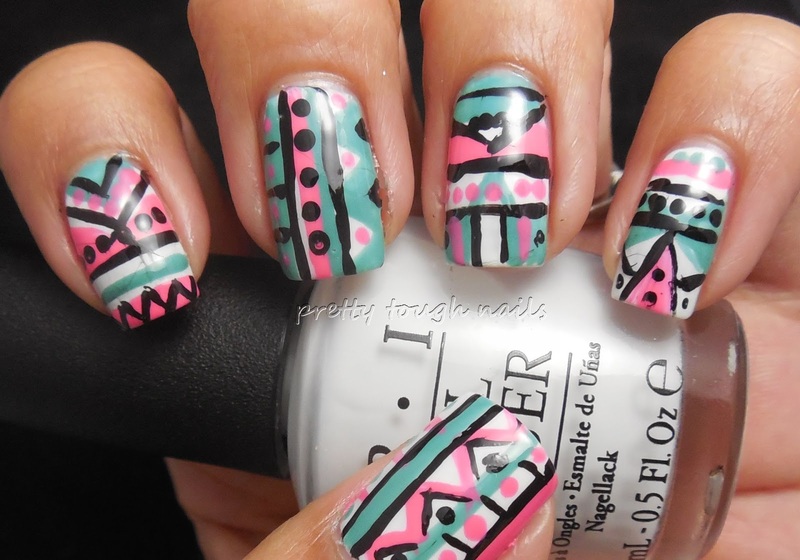 Viola, my first attempt at tribal nails! I then layed a thick coat of my Poshe/NYC GCS mix over top and managed to not smear the black too much. 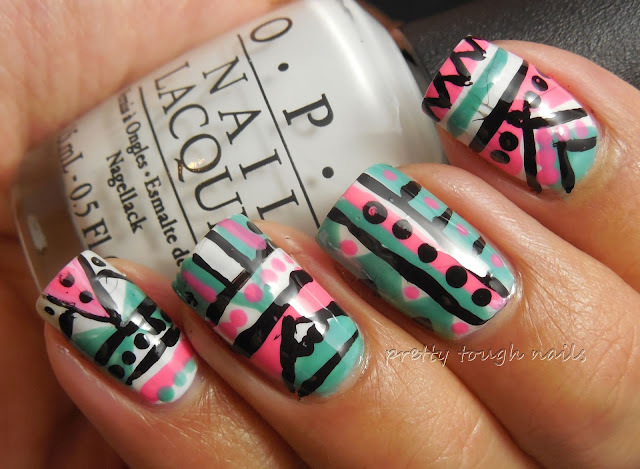 This is one of those times where I wish I had some nail art pens, but I can't seem to find a good one in my area. I've heard the Barry M one is good, but unfortunately those aren't accessible to me. If anyone has any recommendations, I'd love to hear it! I'm looking forward to seeing how the other ladies fared with this challenge - look below to find out! These look great, especially for your first attempt! I have a great pen that also has a striper that I got for $3 for nailsupplies.us. I plan on getting more since it works really well. thanks dear! I will definitely keep that in mind next time I need to make an order. I appreciate the suggestion! Why hello there! thanks for following! aw shucks, I appreciate the compliment. Flattery will get you everywhere! This is so awesome! I can't believe this is your first time doing this. I love the colors you used together. Thanks sweetie! I tried my best! I was hoping the color combo would make up for the amateur attempt. I like the rough, earthy look of the black lines- so authentic looking! lol, thank you! rough is right!